The Monticello School District recently received the results of the school district report card from the DPI for the 2016-17 school year. We are very excited to report that for the second year in a row our district received a 4 out of 5 star rating, which translates to our district Exceeding Expectations. Our elementary school, which received 2 prestigious awards last year (Department of Public Instruction School of Recognition award, State of Wisconsin RTI Bronze Award) led the way with the highest rating of the 3 district schools missing a 5 star rating by only 4 tenths of a point. Monticello School District’s 4 star rating matches the top schools in Green County and surrounding counties. When looking at comparable schools (similar population and demographics) in Green County and in nearby counties, Monticello’s overall rating is higher than those districts. 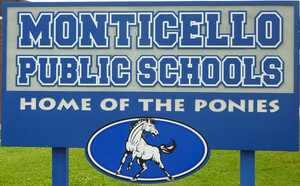 Monticello School District is continually striving for excellence. Our state report card indicates that we are fostering growth and closing gaps, while helping students reach the standards set forth by the Department of Public Instruction and the state of Wisconsin. We are very proud of our ratings and growth, but also realize that our mission is to continue to look for ways to improve as a district and meet the needs of all of our students, and ensure that our students are world ready citizens.